2nd Floor Rear officially wrapped as of noon Sunday, and the festival seems to have been a smashing success. A giant thanks to all contributers, hosters, helpers, and funders! Please see the collaborators page for a complete list of people to whom kudos are due. Also, keep an eye on this blog for soon-to-come festival photos, afterthoughts, and more. 2nd Floor Rear is underway as of now! We have two event updates from contributors. Learn more about Anthony Stepter’s Call for Artists here: http://www.callforartistsproject.com/, and the PJ Party Brunchfast here: http://itsaponyprojects.com/2012/02/03/pj-party-drop-in-brunchfast/. Welcome to 2nd Floor Rear 2012! 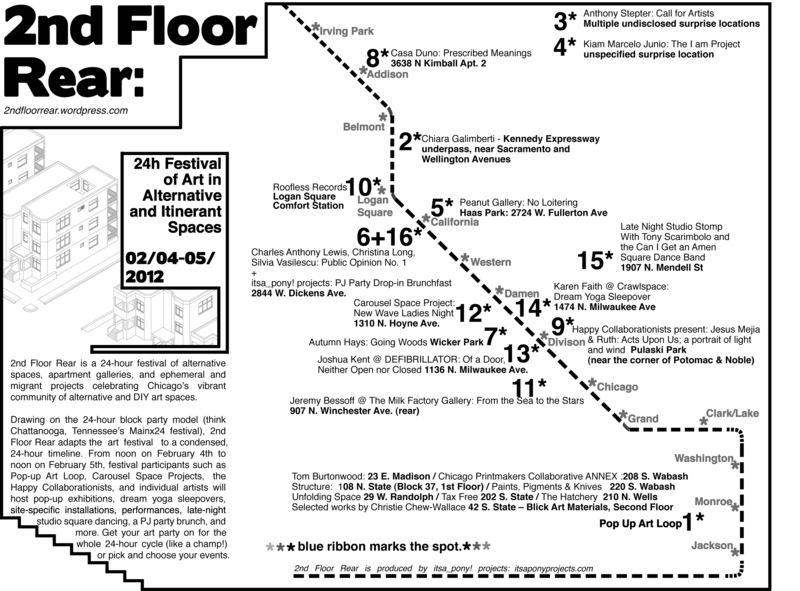 Printed maps will be available at all indoor spaces. 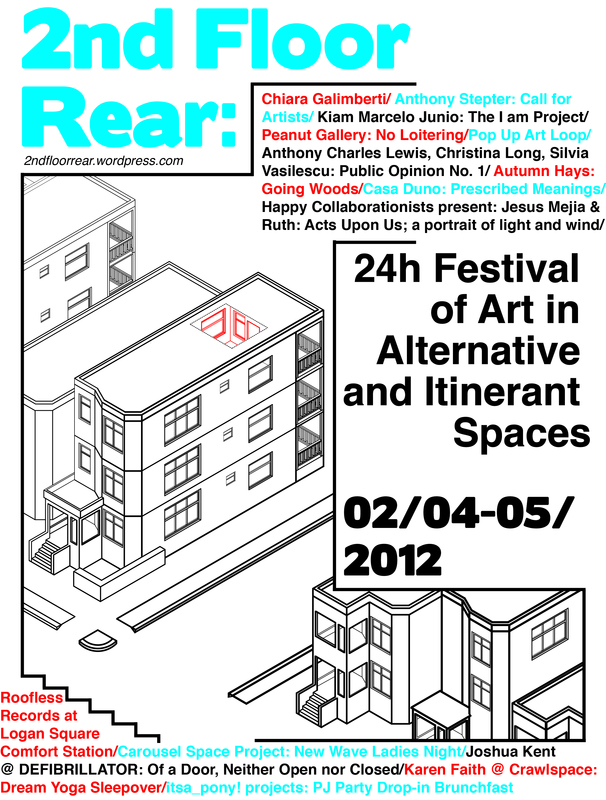 You can also download a schedule of events: ghid 24h spate and a map: ghid 24h fata beforehand. With the exception of some outdoor installations that can only be located by happenstance, all sites will be marked with a dash of sparkly blue ribbon and perhaps some blue chalk markings, so be on the lookout for those things as you search out some of the more off-the-beaten path sites. Some last-minute SOS’s: we are still looking for a photographer who can meet with the festival producer tonight and commit to documenting the festival from around 11am to midnight on Saturday (you will be paid!) and the itsa_pony! PJ Brunchfast needs some help running errands before/during Sunday morning, so if you would like to pitch in, or are interested in taking photos for money, please email itsa_pony! projects at itsaponyprojects@gmail.com. …in, like, a few hours. After I take a quick disco nap, or have some rather truncated sleep. In the meantime, the Kickstarter campaign was a success!!! Bright and early tomorrow I plan to post a shiny new post for you complete with updates, tips, a downloadable festival map/schedule of events, and more. In the meantime, tell all your friends about Saturday and remind yourself to check back in tomorrow for more. Hey everyone! Only 4 hours left till the deadline for the Kickstarter campaign and we are $49 shy of our goal. So close! Awesome prizes! Even more awesome festival! Contributing is pretty much a win-win-win.